If biologists’ best guess proves correct, these ants raise their insect herds for meat, not milk – the first example of meat farmers other than humans. And that’s not all. The insects they cultivate may be the best example of true domestication outside of our crop plants. Of course, we should wait for the work to pass through peer-review into the technical literature before drawing any firm conclusions. I’d not be surprised, though, if meat-farming by ants turns out to be true. After all, some ants actively farm fungi and others herd scale insects. What’s yet another Ants-Invented-It-First story? While I think it would be interesting if this turns out to be correct, it really does not serve us to descend into hairsplitting here trying to wring and wriggle out “new” concepts. Have the plants that generate/evolve food-bodies (meat? )/nectar/nesting space for ants domesticating the ants or vice versa ? /snark Yeh, it’s the first example of meat farmer plants growing the meat to domesticate ants. /snark Have the ruminants domesticated the cellulose specialized gut flora or vice versa, speaking of meat, lol. There is no question that ants and insects in general serve as the perfect generators of accessible conceptual paradigms, as in this case or to demonstrate ‘sonar’ and countermeasures against it, for instance. Almost all of these insect paradigms deserve intimate investigations so that humans can learn how to do it ‘right’. For instance, how can ant’s use the same bacteria for evolutionary lengths of time without the antibiotic system failing as has happened with humans and MRSA ? I attended Scott’s talk, which I though was one of the best delivered presentations of the entire meeting. My recollection is that Scott did not present any evidence demonstrating scale predation, nor did he claim to have presented any such evidence. But he did present a circumstantial case favoring this scenario. Knowing Scott as I do (I served on his Master’s committee), he will do an excellent and rigorous job exploring this hypothesis. 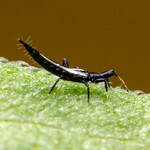 Other ant species do sometimes dine on their hemipteran symbionts, particularly aphids. For the curious, I cited several examples in a recent paper: Wernegreen et al., 2009. One nutritional symbiosis begat another: Phylogenetic evidence that the ant tribe Camponotini acquired Blochmannia by tending sap-feeding insects. BMC Evolutionary Biology 9:292. (Citation numbers 47-50 in that paper). So the evolution of obligate carnivory in Melissotarsus certainly seems plausible to me…. Well, I hope the ants are using humane slaughtering methods or they can forget about any armoured scale insect exports from Australia. Seems like weak inference – maybe the scales are just exploiting the ant homes and are protected by a chemical cover. The apparent repeated loss of the protective scale would also support an ant-inquiline relationship. Finding that the ants sometimes eat a scale would not improve the inference: all of ant-bug systems should be dynamic and under selection. Those scales that failed to produce their cover in time would tend to be eaten (don’t ants sometimes harvest aphids etc.?). I think direct observation is a better test here than stable isotope analysis (which reads almost like a pun). I thought some Formica and Camponotus will actually eat the winged forms in their aphid herds to control the populations and discourage other ants from herding nearby. Isn’t that kind of the same thing? That is a very stubby ant. Its stubbiness knows no bounds. Seconding Andrew & Turcano, that’s one adorable ant. It’s so stubby it’s almost a beetle! Are they fossorial or something? 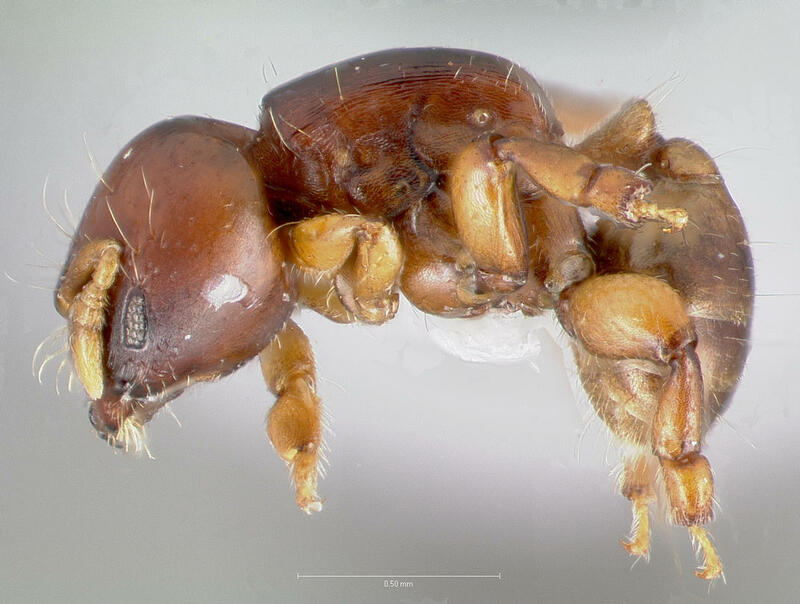 I am currently working on the said ant (Melissotarsus) and I was under the impression that I was the only one who thought it was cute! I’m glad you all agree! They are not fossorial. 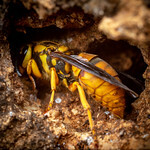 They create colonies by excavating galleries in trees. They close the galleries using fragments of wood and silk that they spin out of a gland in their heads! Talk about amazing ants! They have evolved to live within these galleries and therefore have small eyes and a middle set of legs that points upwards. If you place them on a flat surface they’ll have a hard time walking!